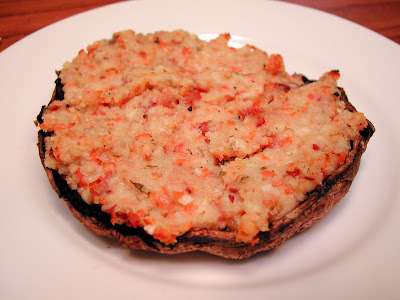 I love portobello mushrooms. They are almost like eating steak, and when they are stuffed, it's just heaven. I looked around online for recipes and sort of picked a little from here and there and came up with this fabulous, delicious, rich but not too fattening recipe. These mushrooms could also be quartered and served as an appetizer. 1. Clean mushrooms. Remove and discard stems, using a teaspoon, remove the black, fibrous underside of the mushroom caps and discard. Place mushrooms, cap side down, on a baking pan lightly sprayed with cooking spray. 2. In a medium saucepan cook the shallot, carrot, and garlic in butter over medium low until tender. Stir in bread crumbs, yogurt, mayo, cheese, and bacon. Spoon crumb mixture into mushroom caps. 3. Bake until mushrooms are tender and filling is hot, about 12 to 15 minutes. *Strain yogurt by placing in a colander lined with paper towels for about 30 minutes. **For an easy way to cook the bacon, line a baking sheet with foil and place the bacon evenly on top. Bake in a 375 degree oven for about 15 minutes. Place bacon strips on paper towel lined plate to dry and absorb excess grease. Ooooo, this looks sooooo good! I might just have to get some mushrooms soon.